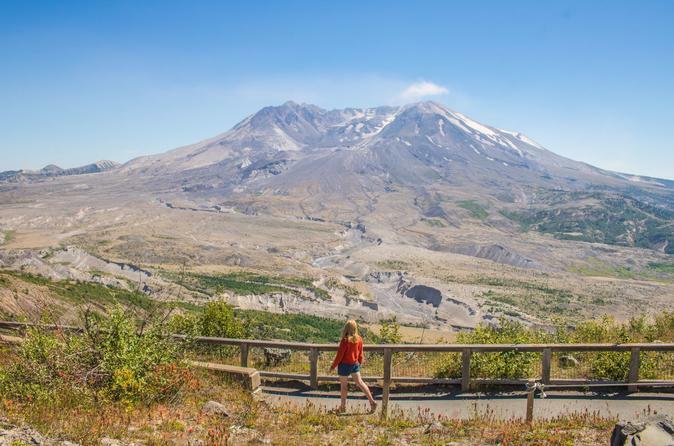 Tour one of Seattle's top attractions, the impressive Mount St Helens National Volcanic Monument, on this full-day small-group tour. Your tour begins with a downtown Seattle hotel pickup and a light breakfast including pastries and hot beverages. During the 3 hour drive from Seattle to Mt. St. Helens National Volcanic Monument , your naturalist guide will tell you about the infamous volcanic eruption of 1980, which destroyed nearly 230 square miles (370 km) of forest and covered eastern Washington in volcanic ash. Learn about the ongoing reforestation project and discover how well the ecosystem is recovering from the eruption. Arrive at the blast zone, located 5 miles (8 km) from the crater at the Johnston Ridge Observatory, and take in magnificent views of the steaming volcano. Your guide will share the magic of the geological events surrounding the 1980 eruption through a variety of stories and facts. The observatory's state-of-the-art interpretive exhibits portray how the landscape transformed, and how the eruption opened up a new scientific era of monitoring active volcanos and forecasting eruptions. Take a short walk on the Eruption Trail with your expert guide and admire views of the lava dome, crater, pumice plain and landslide deposit. In the afternoon, enjoy a gourmet picnic consisting of fresh local food and wine. Snacks and drinks will also be provided throughout the tour. See the Itinerary section below for a sample menu. Special Offer - Book and travel by October 31, 2017 and save 20% off our previously offered price! - Book Now!